If you’re looking to capture the thrill and experience of your rides, a good motorcycle helmet camera is a smart place to start. Not only are they able to catch amazing video, they’re easy to use and don’t pose a distraction or safety concern. Using a motorcycle helmet camera is a great way to keep the excitement going long after you get off the bike. Sometimes it can be just as wonderous to see the footage as it was to go on the ride, especially when there are aspects you didn’t notice before. You never know what you’re going to see while you’re out there, and it can be a lifesaver to have a camera with footage you can go back and look at it. It’s always good to be prepared. If you’re going to be recording your adventures, you want to make the best possible videos. That means high quality recording, and a durable camera that can endure the elements. Showing off footage from your adventures can be a fun and exciting part of the whole ordeal, but it can quickly become embarrassing if the footage is poorly shot or if there is a bunch of background noise and shakiness. There are plenty of helmet cameras out there that can correct things like background noise, extreme wind and weather conditions, and even shakiness of the actual footage. If you skip out on these features, you will probably end up with some unusable footage. Anyone considering a motorcycle helmet camera should do their research first, as different ones are suited better for different purposes. It’s important to know what it is you are going for before just grabbing the first camera you find. We’ve compiled a list of the best motorcycle helmet cameras to make your search a bit easier. Check out these products as you look into your next purchase. This motorcycle helmet camera is an affordable and great choice for someone who wants to capture their experiences to enjoy watching at a later time. With Garmin being such a trusted and well-known company for navigating, it’s no surprise many trust them to capture their favorite moments in real time. It can shoot amazing, high quality videos in 1080p30 and 480p120. The camera features an all-glass lens, which works with the high resolution and quality zoom levels to get you the best possible shots. The camera has a photo button to get quick snapshots, as well as an ability to shoot wide-angle photos at 10 frames per second. The camera even lets you take snapshots while you’re recording video, so you never have to miss your shot by trying to adjust the settings. Another cool feature of this camera is the auto-capture function. You can set the camera to take photos in intervals of up to 120 seconds, meaning you can get a bunch of cool photos from your trip, without ever having to think about them. The camera will sleep in between shots, which helps maximize your battery life so you can keep capturing for longer. It’s also waterproof up to 50 meters, so you can really capture a wide variety of experiences with this helmet camera. The device also has a GPS, which will help keep you safe and on track. One of the coolest features of the camera is the mobile app and desktop software you can hook up with it. Once you’ve connected, you can play back your videos while the software overlays all the information from your trip, including speed, acceleration, heart rate, and more. This is an amazing product for anyone who is into riding with others. If you are riding solo, you probably will find a better value for your needs, as this is meant to get other riders in communication with one another. The headset and camera are both WiFi enabled, and use a single-bodied design that incorporates both the video camera and the headset. It can shoot in 1080p with 60 frames per second, or 1440p, with 30 frames per second. The camera can take photos in shots, bursts, or timelapse. This leaves a lot of room for getting creative with your camera footage. The lens can rotate up to 30 degrees as well, allowing for more to be captured. There is a smartphone app for iPhone and Android that is meant to be used with this camera. It also has advanced noise control which will prevent your videos from being too abrasive on the ears. The device is waterproof, so you could easily take it on a trip during inclement weather. The memory card supports MicroSD up to 64 GB, though no memory card is included with the product. The big stand-out about this product is the headset, which allows you to connect with up to four other riders at a time. That means you can share your thoughts and experiences as you adventure around together. This is usually not possible with all the other sounds surrounding riding. We can’t have a list of the best action-having cameras without throwing in GoPro, and for good reason. A unique feature of this camera is the ability to stabilize while you ride. It can predict movement and correct the camera to make sure your footage comes out smooth and not shaky. It also has the option of time warping, where you can get stable time lapse videos as you move around. The speed can be adjusted up to 30 times the original to condense your long activities into easy-to-watch, shareable experiences. The camera will automatically apply HDR, as well as tone mapping and noise reduction which will ensure your shots come out as high quality as possible. It’s also waterproof up to 10 meters, so you can easily take it out to capture moments you normally wouldn’t be able to. As you’re riding, you won’t want to stop and change settings. This camera uses voice commands to switch from recording to taking photos, making it a hands-off tool for when you’re riding. The camera is easy to navigate and resembles using a smartphone. It also lets you live stream directly to Facebook Live as you go. This camera records high definition videos in 4K resolution and 20mp, ensuring high quality footage of all your experiences. It has a waterproof case which allows you to go up to 30 meters underwater without any issues. It also has a built-in image stabilizer which makes shooting fast objects or activities easy. There is an app that goes with the camera, and it allows you to send photos and videos to your friends whenever you want. You can pick and choose which experiences you want to send to who. It uses a touch screen which switches between photo and video mode easily. 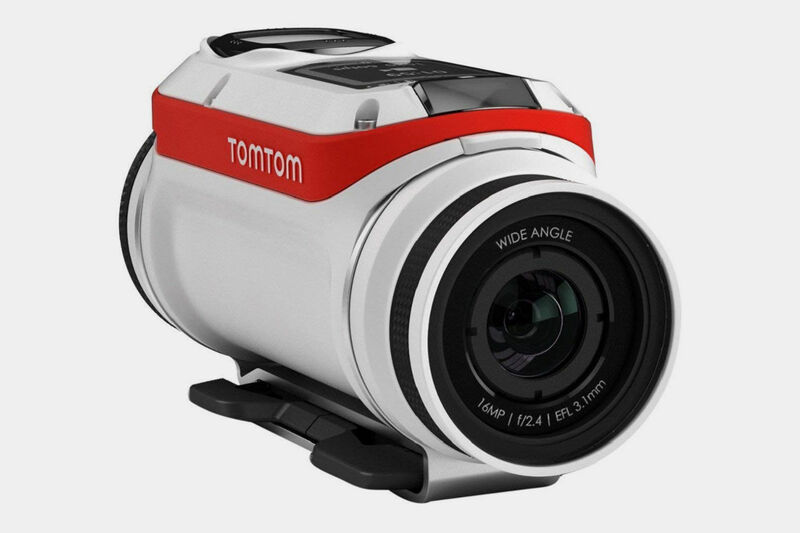 There are also time lapse, motion detection, underwater, loop, and more settings that go with this camera. This is a great, affordable choice for someone who wants to capture their adventures without breaking the bank. It shoots with full HD video and photo resolution, with 12MP and 1080P to guarantee the best results. The lens has a 170-degree angle, and lets you capture wider scenes and more of your surroundings. The camera is also waterproof up to 30 meters, allowing you to record even in the harshest of climates. It would be great if you also plan to engage in water sports, or like to go out in harsh weather. It uses a wireless remote control connection, which hooks up to your phone through WiFi. It comes with two rechargeable batteries, so you won’t have to worry about losing power at inconvenient times. Nikon is a trusted brand when it comes to cameras, so there is no surprise that they would make a great product for capturing the thrill of the moment. This camera captures more than your eyes see with its 360 degree views. It has image sensors to capture what you’re seeing, as well as sensors to capture what you can’t see surrounding you as you go. When you go back to watch your footage, you’ll see all the stuff you missed while looking ahead. The camera is waterproof up to 98 feet, and can go as low as 14 degrees Fahrenheit before being damaged. It’s also shockproof for up to six feet, so if you drop it, all is not lost. It stores information regarding the rotational movements and vibrations as you ride, and then counteracts those movements during playback. This way you can watch smooth videos without having to be careful as you ride. You can also do time lapse sequences, slow motion videos, or even take snapshots as you go. The videos and photos can be viewed, edited, and shared through the mobile app. The camera is lightweight and easy to mount pretty much anywhere, making it a great choice for a motorcycle helmet. Nikon also offers many types of adhesives, mounts, helmet straps, and more to make sure you can record whatever it is you need. Polaroid is a well-known name in film, but their reach has soared over the years as they’ve added more high-tech products to their collection. This camera has a unique and fun look to it, and strays from the typical action camera aesthetic. It’s super easy to attach to any helmet, but you will need to get the helmet mount before doing so. It uses image stabilization technology to ensure that your photos are not too shaky or distorted to watch after you film. It can record up to 107 minutes of footage, so it would not be a good choice for someone who wants to film super long adventures. It is weatherproof, so it will hold up in most situations. The lens is 124 degrees, allowing for a wide-angle view of your surroundings. The camera is WiFi enabled, and works with microSD cards for up to 128 GB. This is a small, compact and convenient camera that would work well for capturing exciting moments. It is easy to attach to a helmet, and can even go underwater or be use for surfing. This also means you can easily take it out in terrible weather conditions, as it won’t be affected by the elements. It shoots in 720P Hd, allowing for good quality videos in an easy manner. The camera is touch screen as well, making it easy to use. The camera comes with a helmet mount and belt, as well as a suction, a car charger, a waterproof case, and more accessories. Unlike many others on the list, this camera is rather low on list of features, and just works well for what it is meant to do. It is not WiFi enabled, and does not use an app for sharing or editing the footage. Another GPS-gone-action-camera, this motorcycle helmet camera will have you recording top quality footage in no time. It records professional looking videos with the 4k ultra HD resolution. You can easily edit your footage on your phone as well, without ever having to download the recordings anywhere else. You will need to download the TomTom app to complete this part. The mounting system is super effective and simple. You just have to clip it into place and you’re good to start recording your adventures. The battery can shoot for three hours of non stop footage in full HD. This gives you a lot of opportunity to capture some magic before having to go recharge it. It also has waterproof capabilities for up to 40 meters deep. You’ll just need to put on the waterproof dive lens before getting the camera in contact with water. The camera also has motion sensors which can identify the most exciting parts of your trip and highlight them to you immediately. This makes finding the climax of your journey much easier than having to scroll through hours of footage. There you have it, the best motorcycle helmet cameras available today. Be sure to use this list as a guide to deciding what features are most important to you, and what kind of features you can live without. Everyone has different reasons for wanting to record their adventures as they ride, and it’s important to align those reasons up with the best product available to fit those needs. That’s why it’s so important to know what the main features of the best products available. With this information, you should be able to settle on a good camera in no time. There’s nothing more exciting than being able to preserve and share your memories forever.